Microsoft as a whole announced $18.53 billion in revenue for the quarter that ended in September with operating income of $6.33 billion. This includes a $113 million deferral of revenue from Windows 8.1 pre-sales. For comparison the numbers from the same quarter in 2012 are $16 billion in revenue and $5.3 billion in operating income. Here’s the breakdown of the numbers. 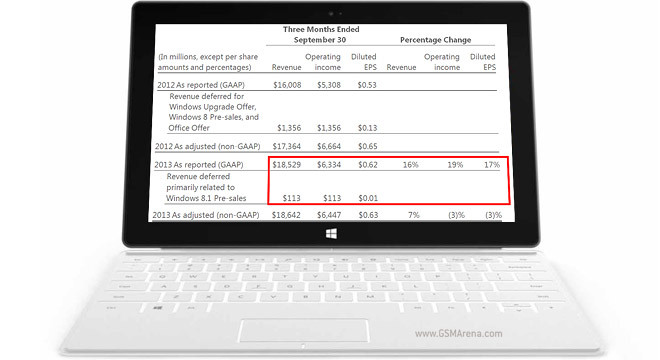 Windows OEM revenue dropped 7%, despite growth in Windows Pro sales. Search and advertising grew 47%, rounding off a 4% growth to Devices and Consumers for a total of $7.46 billion. Commercial revenue grew 10% to $11.2 billion with Commercial cloud revenue doubling. SQL server, Lync, SharePoint and Exchange grew double digit percentages too. You can find more details in the press release. Back to the Surface tablets. Revenue from them reached $400 million, despite thinning margins. The Surface RT (now just Surface) got several price cuts – first to $199 for educational institutions, then another price cut to $350 for the masses. The Surface Pro very recently got $100 slashed off its price too (but that’s too soon to have affected sales). To be clear, we’re talking first generation Surface here as the Surface 2 and Pro 2 only went on sale this Tuesday.